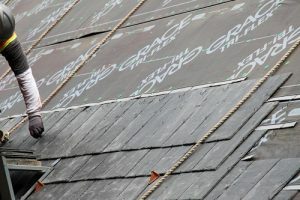 If you are looking for a lifetime roofing material that provides superior durability and a touch of elegance, you should consider investing in slate roofing. Its natural beauty and remarkable longevity are what keeps them unmatched by other materials. The slate will enhance the look of any architectural style and is available in an array of natural colors and textures. Slate is more durable than any man-made material. A slate roof can easily last over 100 years, which is at least double of what other roofing materials can offer. Installing a slate roof on a house will increase its resale value. Not to forget, its aesthetic appeal will make your home look attractive for potential home buyers. We provide new slate installations with the help of the largest slate producer in the United States (Newmont Slate). You’ll know you’re getting a great product and installation. We use Newmont Slate to provide professionally done slate repairs with matching slate. It is important that your repaired slate has the same color as the rest of your aged slate. Slate is versatile, beautiful, and affordable. If you would like more information about our roofing services, consider hiring Quinn’s Construction and we will educate you on what you need to know and to expect about your roofing options. Contact us for a free estimate at (978) 957-1200 today. We provide our services throughout North of Massachusetts!